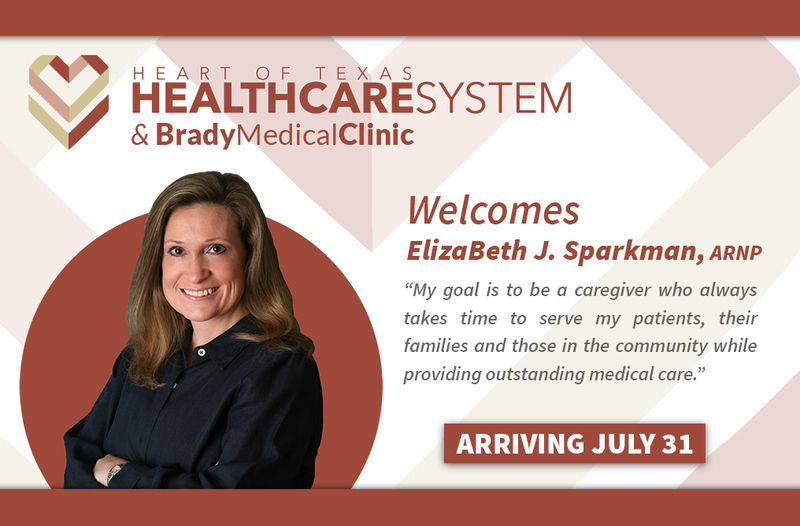 Today we welcome Elizabeth Sparkman, ARNP to the Brady Hospital/Heart of Texas Healthcare System family! Originally from Iowa, she brings her skills and expertise as a Nurse Practitioner to Brady in order to provide excellence in medical care to families in the area. In this second part of the series on immunizations I plan to discuss measles, mumps and rubella (MMR) and varicella vaccines. Years ago these were called “usual childhood illnesses” because nearly everyone had them as a child. There were however some people that did not get them as children who had much more severe illness as adults, often when their own children became ill with them. Measles is an illness caused by a virus which when it causes infection grows in the tissues in the throat and lungs. It causes fever, runny nose and a widespread rash. The rash usually develops in 5-7 days after the first signs of infection and may be accompanied by fever as high as 104. It is spread by respiratory droplets such as from coughing or sneezing and is so contagious that nearly any child exposed who has not been vaccinated will become ill. Complications related to measles infection include ear infections, pneumonia and encephalitis. In pregnant women it can cause miscarriage or premature birth. For those who develop encephalitis (an inflammation of the lining of the brain) seizures and deafness can result in lifelong impairment. Worldwide approximately 164,000 deaths occur because of measles infections, mostly in developing countries. This year the United States is experiencing a record number of cases of measles with 592 reported from January 1 to August 29, compared to less than 200 last year. Travelers often bring measles back from places where immunization levels are not high including India, the Philippines and most of Africa. The danger of these outbreaks is for infants less than 1 year old who have not yet been vaccinated and who are at the highest risk of complications and death. Mumps is also a viral illness. It is another illness that is spread by respiratory droplets from coughing and sneezing. It can also be spread by the hands of an infected person who has rubbed their nose or covered their mouth while coughing or sneezing and then touches items around the home before washing their hands. Symptoms of the mumps include fever, headache, muscle aches, fatigue and the characteristic swelling of the salivary glands. The illness may last as long as 2 weeks and those who are ill should be isolated until 5 days following the first signs of swelling of the salivary glands. Complications of mumps include hearing loss, encephalitis, orchitis (swelling and inflammation of the testicles) in males who become ill after they have reached puberty. Fortunately deaths related to mumps are rare. So far in 2014 there have been 965 cases of mumps in the U.S. with several outbreaks occurring on college campuses. This is almost double the number of cases seen in 2013. Rubella is a viral illness sometimes called German measles or 3 day measles. It is spread by respiratory droplets such as from coughing or sneezing. The disease is usually mild with low grade fever, rash and mild achiness. The big concern with rubella is when a pregnant woman becomes infected. This virus causes many problems for the developing infant including deafness, cataracts, heart defects, spleen and liver damage. It can also cause fetal death. The most significant problem is when the infection occurs early in the pregnancy (often before a woman knows she is pregnant). Varicella or chickenpox is another viral illness. It is another disease spread through the air by coughing or sneezing. It is very contagious. It causes fever, a blister-like rash, itching and achiness. The disease usually last 5-7 days. It can be very serious in adults or those with weakened immune systems. Complications of chicken pox include encephalitis, bleeding problems, pneumonia, secondary bacterial infection of the lesions, sepsis (blood infections), toxic shock syndrome, bone and joint infections. It can cause death often in otherwise healthy adults who contract the disease from their children. I have personal experience with this. I did not have chicken pox as a child and the vaccine was not yet available. I was 31 when I had chicken pox. I was with my niece for a few minutes the day she broke out with chicken pox and about 2 weeks later I became ill. I had a fever for several days of 103-104 and a very extensive rash. I was off work for 2 full weeks because I continued to develop new skin lesions for a full week and then had to stay off work until all of the lesions were scabbed over. It caused serious concerns because I had been at work in the days before I became ill and in fact I found the first lesion while I was at work. Infection control worked overtime monitoring the situation because I worked in a hospital. The MMR and MMRV vaccines are given at age 12 months and a booster is given at 4-5 years old. So as you can see these seemingly “usual” childhood illness can cause life altering complications and death. Please vaccinate to protect your children and the people around you who may not be able to take the vaccine or who are too young to take the vaccine. I would have never guessed that immunizations would become so controversial. I remember as a child standing in line before kindergarten waiting to take the polio vaccine, AKA ‘the old sugar cube’. My mother was thankful to have this option as she knew what it was like to have friends fall ill with this dread disease. Many polio victims ended up with severe neurological damage, wasted limbs, and/or iron lungs required to aide with breathing. Polio is not just a disease of the past, today there are children in Syria and Iraq who are suffering the devastating consequences of this dread disease. The controversy surrounding immunization gained steam in 1998 when British physician, Dr. Andrew Wakefield published a study linking MMR vaccine with autism. What many people don’t know is that the study was based on only 12 children and was not done in the appropriate scientific manner. Many studies from around the world have since debunked any link between autism and MMR, and other vaccines. Unfortunately the damage was done and a few celebrities without science training latched onto this information and influenced many people to stop giving their children vaccines in general. In this three part series on immunizations, I want to remind folks why we give vaccines which is to prevent illnesses that can have serious harmful effects on your children up to and including death and long-term, even lifetime disability. These “childhood” diseases are not benign, harmless colds, they are diseases that prior to immunization killed children. Let’s start with diphtheria the D in the DPT, DTaP and Tdap vaccines. This is an upper respiratory illness and causes a severe sore throat and a membrane which forms in the throat and can obstruct breathing. The toxin produced by this bacteria can cause heart and nervous system problems. The illness may last for weeks without treatment. Prior to vaccination, up to 20% of children under age 5 died from this illness. Ask your grandparents about this illness they may have lost a younger sibling to this disease. Perussis, the P in DTaP is also a respiratory illness, referred to as whooping cough. Unfortunately we are seeing a resurgence of this disease in many areas, including Texas. I have in fact had 2 adult patients in the last years who developed pertussis. This disease is especially dangerous for infants and young children who can and do die from it even today. It causes a very distinctive cough with a “whoop” sound and can be so severe as to leave the person breathless. It is important for adults to get the newer vaccine called Tdap because over time our immunity decreases and while the illness doesn’t usually kill adults, if we have it, we can pass it along to young infants who are not fully immunized and in whom it can be deadly. This is definitely not a gift any grandparent wants to give that new grandbaby. There have been 1079 cases of pertussis in Texas so far this year. The T in DTaP is for tetanus, what your grandparents call “lockjaw” because it causes a spasm of themuscles. Tetanus is a disease caused by a toxin produced by the bacteria. The bacteria is found in soil and enters our skin through a wound, scrape or cut. In a person not vaccinated for tetanus gardening and ranch work with a cut on the hand could lead to infection with tetanus. Fortunately the vaccine for tetanus is very effective and we see very few cases in the U. S. In other places in the world where vaccination is not as available, infants often die from tetanus shortly after birth because of dirty, unsanitary conditions. The last disease I want to discuss today is Haemophilus influenza b. This is what we are protecting against with the Hib vaccine. This bacteria lives in the respiratory tract where it usually causes no problem. It is spread by respiratory droplets when an ill person or a carrier coughs or sneezes. This bacteria causes meningitis. It can be fatal or leave the child who recovers with serious neurologic damage including hearing loss. When I started PA school this was one of the dread diseases because of the devastation it could cause. Parkland and Dallas Children’s hospital saw several hundred cases each year in children under age 5. The year following the start of vaccination for this disease the number of cases dropped to a handful. Texas had fewer than 10 cases last year. This is the end of part one of this series on vaccination. In the next article I will be discussing vaccines for measles, mumps, rubella and chicken pox. Part 3 will include the vaccines for Hepatitis, polio and meningococcal meningitis.